On February 4, 1011 students and faculty literally moved Western to its hilltop home. English professor Gordon Wilson recalled that he left his sick bed to help carry "a two horse load" of library books "from down in the valley to the top of the hill." Wilson also remembered that 15th Street was then a "gullied path where even a cow would have had unsure footing." 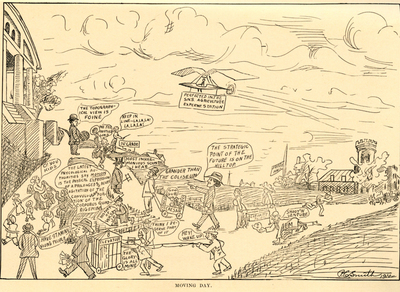 This cartoon depicts Henry Cherry in the center saying "the strategic point of the future is on the hilltop." Gordon Wilson may be the character to the left of Cherry will a cart of books. Franz Strahm is the next character to the left saying "most inharmonious sounds I hear." The cartoon is framed by the original Van Meter Hall of the Southern Normal School on the right and the new Van Meter Hall on the left.